Welcome back Maharanis! We hope you are having a fabulous last day of August. (Where did the summer go!?) 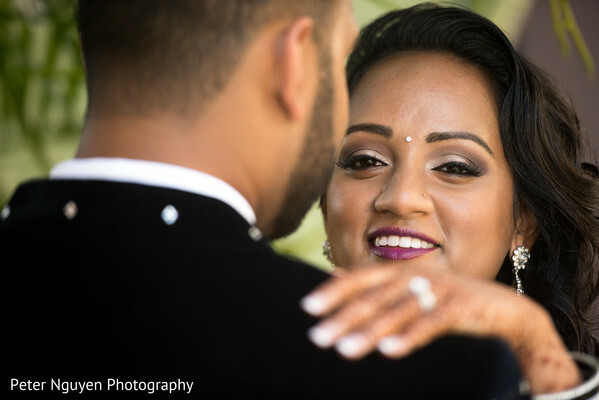 We return with part two of Reepa and Shiv’s tropical destination wedding bash. 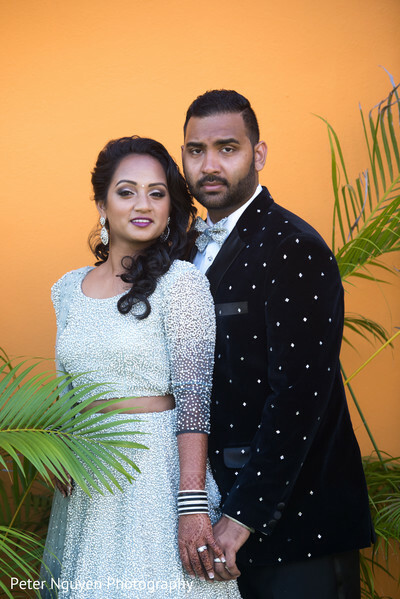 When Reepa and Shiv were ready to tie the knot, Envi Event Planning were both brought on to spearhead the very important task of ensuring that a blockbuster event was pulled together. And boy was this one banging, blockbuster event, featuring fire dancers, aerial artists, and non stop musical beats! 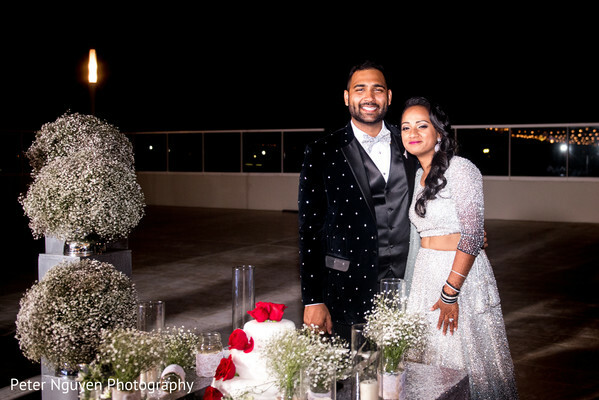 Sharing their love of travel, Maharani Reepa and Raja Shiv treated their guests to a beach side celebration at the Hard Rock Hotel Cancun that their guests would never forget. For the outdoor, poolside reception, Reepa transformed herself to party mode with the help of her makeup artist extraordinaire Styling Trio. 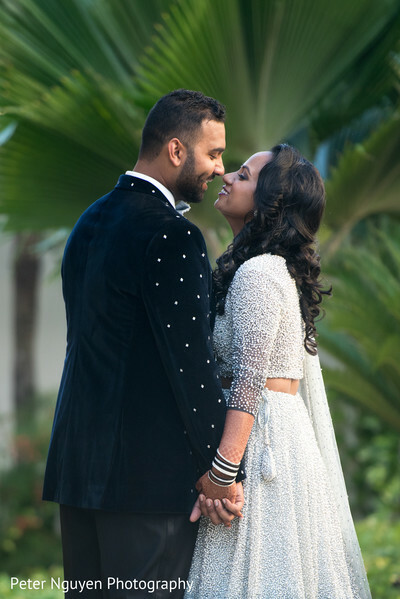 We’re swooning over her ombre, pearl encrusted lehenga that proved that this Maharani is one major fashionista diva. Shiv was also a style maven in his suave suit accessorized with embroidered pearls. Such a cool look! Latin Asia Destination Wedding Decor once again nailed the decor by brightening the gorgeous venue with bright lanterns and blooms. 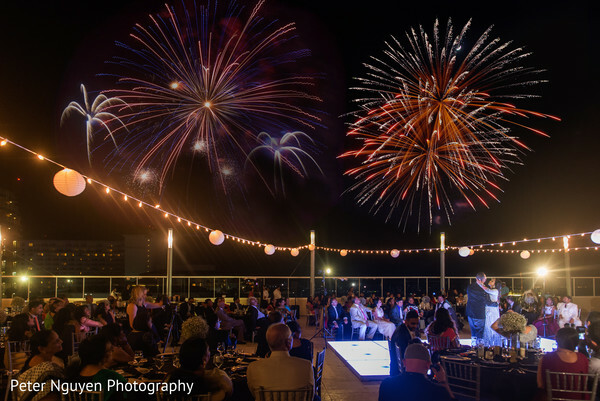 The night crescendoed with sparkling fireworks that Reepa pulled off as a surprise for her charming husband. So cute! Peter Nguyen Photography captured all the majestic images in the full gallery. And scroll below for all the behind the scenes scoop from Maharani Reepa. Shiv and I had everything but a conventional relationship. If you let him tell you the story of how we met, then he would say that he was a man with smooth moves and had me from the second he sent me a message on Facebook. However, if you let me tell you the truth, he was nothing short of a creepy guy on Facebook trying to sweet talk me. Nonetheless, he won. I married the guy! And I must say, it was the best decision I have ever made. Shiv and I had one goal for our wedding, to make it epic! So we decided to go to Cancun and have a destination wedding! Why Cancun? Well, why not Cancun? It’s a short flight from Atlanta, it has breathtaking beaches and it’s CANCUN! 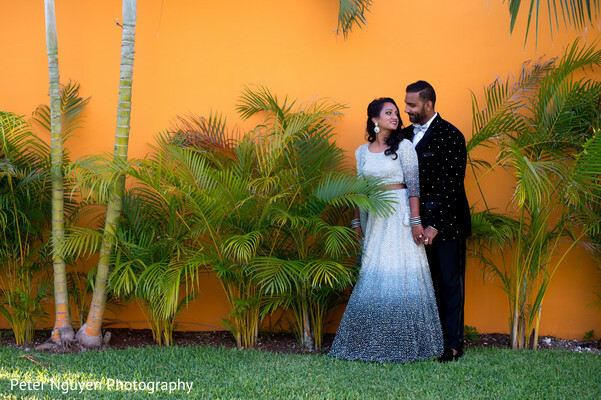 We wanted to pick the perfect place, an all-inclusive resort where guests would feel like they were truly pampered and to give them a once in a lifetime experience, but most importantly for them to feel like they weren’t at just another Indian wedding. Thus, we found Hard Rock Cancun! The best part about a destination wedding is the relaxing environment.I can honestly say that our stress level was very minimal. Shiv and I would wake up and almost every morning we would go get a massage, walk the beach, and have breakfast with whatever friends and family were around. One of my favorite things about my wedding was that all of our guests were in one spot. Any and everywhere I looked I was surrounded by loved ones. Our wedding weekend began with a private VIP check-in that was set up with food and drinks just for our guests to enjoy followed by a welcome dinner on the Breeze Terrace that evening. The next day we had our Garba night indoors, inside the ballroom. Yes. That’s right. A destination wedding and I had an event indoors. But trust me, the guests appreciated an event indoors. We had a little surprise planned for our guests. As they entered the ballroom they were greeted by aerialists that were suspended from the ceiling, serving them drinks. Towards the end of Garba, we had a water drums show where my guests were able to engage and come up to play with the drums after the show was over. This was fun for the kids and adults alike! Friday was the official wedding ceremony which took place on the south side of the beach; it was simple but elegant. 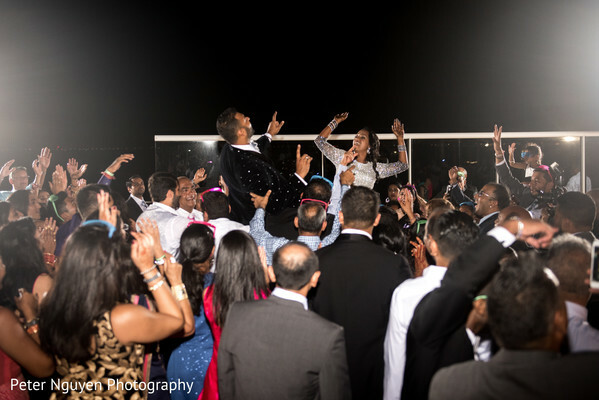 The biggest surprise for our guests at this event was when Shiv and his groomsmen made a grand entrance via Jet Skis! Yes, one of the scariest moments of my life… having the man I am about to marry jet ski through the waves trying to get to the mandap. But as he approached the shore, DJ Hiren had the music blasting. Raman and Sahib had the dhols beating and the guests were dancing and cheering Shiv on. After the wedding, all of the guests retired to change their clothes and met us at Ipanema which is the nightclub located inside of Hard Rock. We were able to get DJ Hiren on the turntables and we danced all night. It was basically the pre-reception to our reception the next day. Now for the reception. This was the last official wedding event and we had to make it one to remember. We had a cocktail hour followed by a fire dancing show before our guests were seated for the reception. This fireshow was amazing! My last surprise was not only for my guests but also for my now husband. 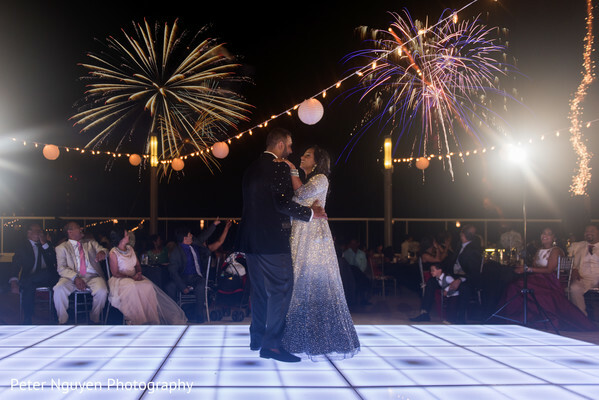 During our first dance I was able to coordinate with Hard Rock to have fireworks go off over the ocean at just the right time. Shiv was completely surprised and my plan was executed perfectly! 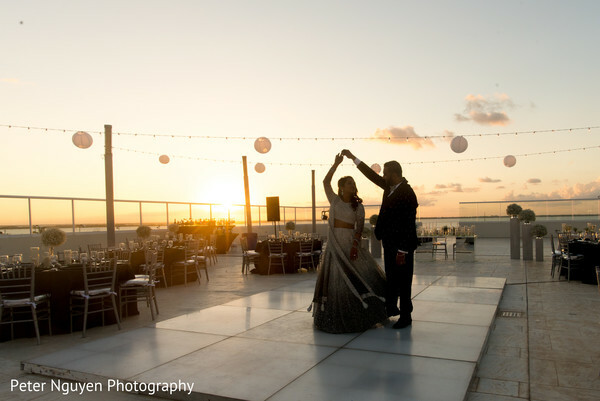 Once the reception was over, the dholis escorted us and the entire wedding party from the rooftop terrace to all throughout the hotel and back to Ipanema. We had the entire hotel dancing to the instrumental performance by Raman and Sahib. Throughout our entire wedding weekend Nadira and Elvia ensured that nothing went wrong and if it did, I to this day have not heard about it. Peter Nguyen, Stephen Renney and their teams made sure they caught every single moment, even if that meant they had to jump into the ocean fully clothed with all of their equipment. 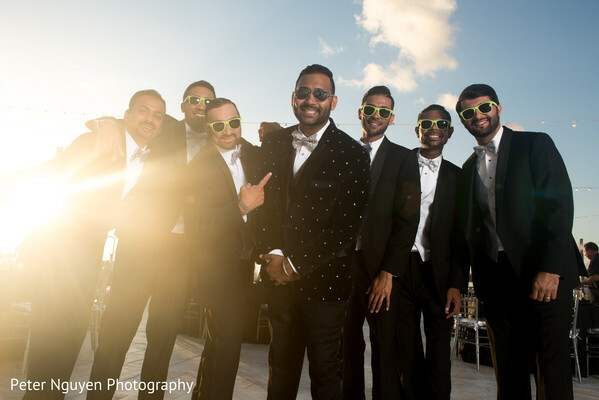 DJ Hiren, Raman and Sahib along with Johnathan and his team with Drums of Paradise gave us that wow-factor we wanted to make our wedding epic. 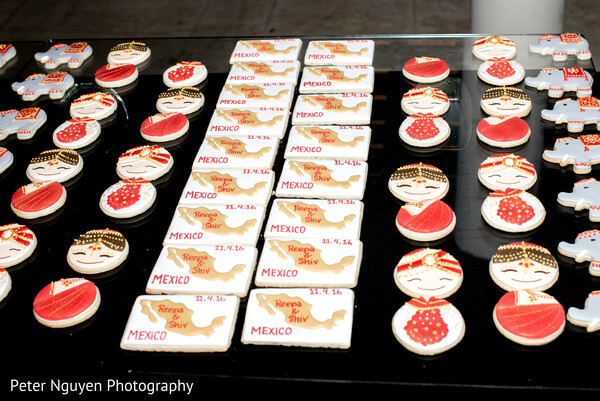 Saku and her team did an amazing job decorating all of my events,indoor and out! 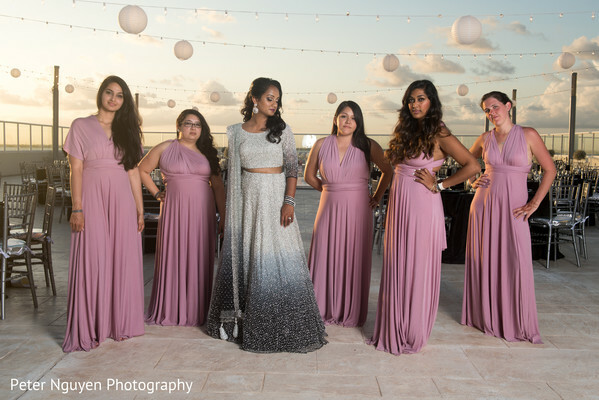 Last but not least, the entire team at Styling Trio came out to make me, my bridesmaids, my family and my groom and groomsmen beautified for the events and did an amazing job. Yes, the groom and groomsmen had their hair and makeup done too. 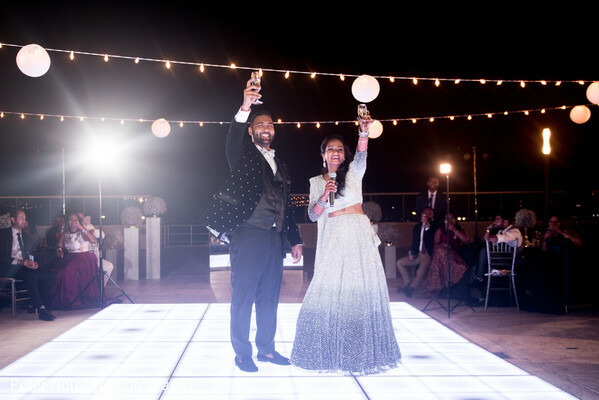 All in all with the help of our family, friends and vendors, Shiv and I successfully executed our epic destination wedding! Spectacular! Have a wonderful evening Maharanis! Envi Event Planning and Peter Nguyen Studio are members of the Platinum Guide. Love what you see? Explore their portfolios.